Just 2 blocks away from the ocean, 650 sqft open space Villa with panoramic ocean views and a very private 200 sgft sundeck. Click on www.VRBO.com/830178 for the Mediteranean affordable 2 bedroom. away from the ocean and Kahakai Park. Enjoy 180-degree ocean views from the dining - living - bedroom and balcony as well as beautiful tropical landscapes with gardens, lava rock-walls, water-features, wonderful outdoor areas to dine and BBQ. This is a perfect cosy getaway for a couple or a small family of 3.
big windows and glass doors to 4 small viewing balconies. Enjoy the amazing Eastside sunrises in the morning from the bedroom, living room, kitchen and dining corner and the four balconies. You will feel welcome in this safe and very friendly neighborhood. This is a fully furnished unit with internet & WIFI and all Utilities. Shared washer on-site. Day (bus stop across the street) that can take you around the Island. Great stay will stay here again!!! We enjoyed our stay especially the beautiful deck off the eating area, lovely. Ocean view is minimized by the trees however it is a lovely spot. The owners Elfie and Manfred are very helpful with info or any needs, my only issue was because of the beautiful windows it became very hot in the afternoon and evening and the place needs some updating. It did not hamper our stay though. Thanks again Elfie, aloha. Quiet neighborhood. Great for morning walks to the ocean. nice deck for relaxing. I have stayed in many rentals in Hawaii, and this was the cleanest and most bug free I've every stayed in. It was also larger than I had expected, given that it is advertised as a studio. It was ideally situated to catch the breezes and keep the house cool and comfortable. Elfie and Manfred are excellent hosts - they were quick to add another outdoor chair when I mentioned I would like to have one - and they were around when needed, but did not intrude. Mahalo for an excellent two week stay. 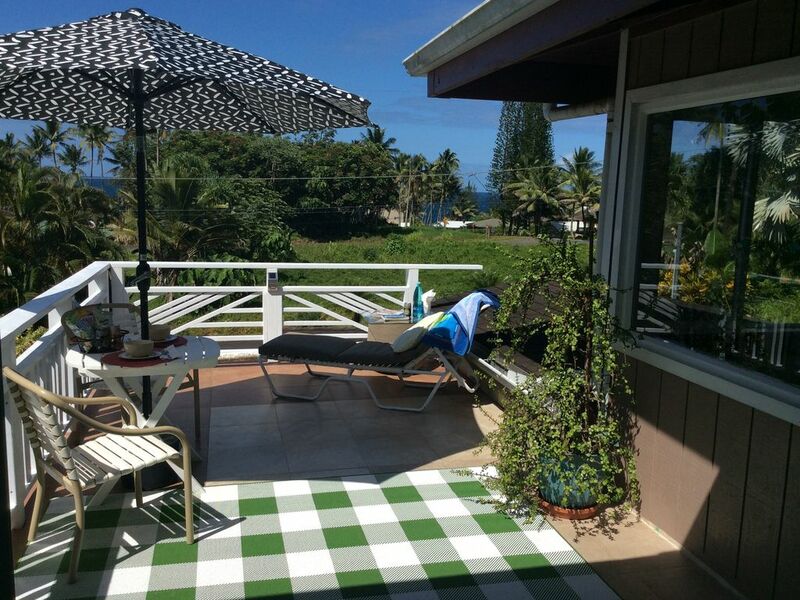 We found this Mediterranean style apartment was the perfect place to stay on the Hilo side of the island. Very clean, spacious, bright, open plan suite with windows and views on all sides. Opening the windows and glass doors along with the fan provides a nice cooling breeze. Elfie and Manfred were very friendly and kind and Elfie has made sure the apartment has everything you need (and more!) for a very comfortable stay. We stayed for 2 weeks so having a washer and dryer available was especially useful. Returning from our daily excursions the apartment really felt like home. Wifi was great so no problem keeping in touch with the outside world (if you must)! Great place to stay. Highly recommended. This is an charming spacious loft two blocks from the ocean. You can see the ocean from the living room and hear it all the time. It is well equipped. There is easy access to a washer and a dryer. A must as it tends to rain a bit each day. The owners are cheerful, helpful and respectful of your privacy.